Sorry, due to our house build, I’m not managing a commercial greenhouse this spring (2017). After many years of being certified organic, we’ve decided to be uncertified but still organic. We’ll follow the organic greenhouse production standards, as we have since 1994, but we won’t be able to use the ‘o’ word to describe our plants or our farm unless we again become certified organic. We were inspected and certified in 2010 by Local Food Plus. Please call or email if you need clarification. Thanks! We buy our seeds from Heritage Harvest Seed near Carman, MB, T&T Seeds near Winnipeg, MB, and Lindenberg Seeds in Brandon, MB. We’re also beginning to save seeds from our own Vegetable and Flower Gardens. 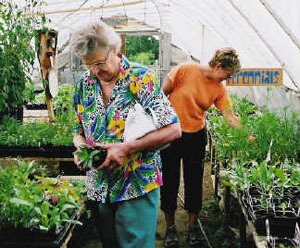 * Specializing in a diversity of medicinal and culinary herb seedlings. 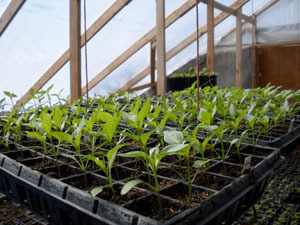 You’ll also find open pollinated vegetable seedlings, some ‘come-from-away’ and native perennial flower seedlings and annual flower seedlings. * Being the first commercial greenhouse in Manitoba to offer certified organic bedding plants – from 1994 to 2007. We continue to grow according to organic standards, and have been inspected by Local Food Plus for the 2010 season, but are no longer certified organic. * Using mostly local ingredients in the growing mix: (Commercial soil mixes have wetting agents that are not acceptable for organic growers.) compost made from horse manure and plant residue, flax shives (a waste material from the flax straw rendering process), Manitoba peat moss, and local sand. The only fertilizer we use is a ‘tea’ made from our compost. We’re experimenting with an organic microrhizal fungi inoculant in the mix to stimulate improved nutrient uptake. * Basing the business at home so that the greenhouse can be heated with wood harvested from the surrounding poplar forest.